The journey to become a doctor, is a long, arduous one and requires the medicos to have necessary coping measures to get through these, unscathed. When I started running (read my running journey here) long distances in Chandigarh, after having completed my higher studies, I started discovering the benefits of the sport which was rapidly becoming more than just a fitness activity. Over the next six years, I enriched myself with its positives making it a passionate pursuit. Running, in those times, was emerging as the fastest growing amateur sport, and stories of physical and psychological transformation, almost bordering on miracles were all around. Having chosen a profession dealing with lifestyle disorders like obesity, hypertension and diabetes, this experience was making it easier for me to motivate my patients not just by words but by my actions, and many of them started running and claimed to have benefitted immensely. Long distance running has been a sport of the older adults, as the patience, mental resilience and ability to stay for long on the road, without burning it all up in a surge, is beyond the generation with short attention spans looking for instant gratification. So, when the college administration suggested that I start a “Running club” for the students, I was skeptical. Very few of them actually volunteered to join. A couple of them were already running in the Pune events and they turned out to be seed members to motivate others to join. Soon there were many of them, girls and boys, some who had never even run more than a few laps of the football ground wanting to run distances of 5km and 10km. Positive testimonials on effects of running in improving their self-image, confidence levels, performance in academics and general well-being were forthcoming in casual chats. Even the college administration felt that the best way to instill a sense of discipline amongst the students is get them addicted to a sport, and what better than an endurance sport which demanded them to be in bed in time for an early morning run, avoid addictions and late-night parties, and eat healthy. Tiring them out in a sport was the best way to channelize their energies, something they all were bubbling with. “Ragging” during the fresher term, so much a part of our introduction to seniors when we joined college, was now practically non-existent with all its negative connotations. Its positive effects of building friendships and camaraderie was now being done on the race tracks and roads, where seniors and juniors were sweating out together, building relationships for lifetime. Distance running is about breaking barriers, mental more than physical, and soon, these kids were raring to run longer distances. Seeing their friends run, those who were not the “physical kinds” too were quick to jump into the bandwagon. And the AFMC marathoners’ club was born. “Marathon” is more than a standard running distance and means different things to different people. So, while none of them actually were running or training to run the distance marathon really meant, the club was so christened because each of these kids was putting an effort, breaking barriers and growing physically and mentally with the spirit that marathon demands. There was a phenomenon of reverse mentoring happening here. As the number of students joined the group, some faculty members were being bitten by the running bug too. The positive impact of running on the faculty and their joining the running group was playing a big role in improving the teacher-taught relationship, and the sports field became the new class room. 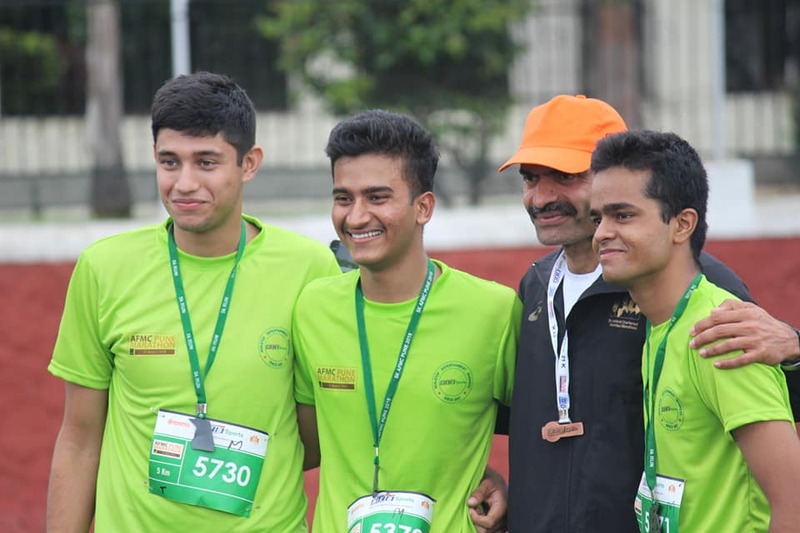 The annual AFMC marathon was a dream I nurtured since the time the marathoners’ club was started and the infectious enthusiasm of the cadets for it was all evident. Getting the stiff army top brass to agree to an unprecedented event of this magnitude required a lot of persistence and repeated unsuccessful attempts. The new Dean, with all her energy and willingness to go beyond the ordinary for the good of the students and the college, came and changed the script. The energy and active participation by the students as volunteers, both on feet and cycles, stole the hearts of the runners who came from across the city and beyond. Soon it was an event being looked forward to by the running community and in the second year itself, had taken the shape of a major event on the national marathon calendar, now with international certification. What it did to the students and faculty at AFMC was to build an immense sense of pride and achievement at getting on the marathon map of the country, as the only medical college to have such an event of its own. It galvanized a bunch of kids into running and character building, watching thousands of inspiring runners racing in their own backyard. Soon, the same kids who had to be forced to wake up and come for the official physical training sessions or the morning classes, were up early on their own and running. Those not making it on time or missing their runs were being pushed and prodded into joining, if not in the mornings, then in the evenings. And the racing tracks of the college stadium, deserted till not so long ago, were getting crowded. Studying for MBBS is a stressful experience, and exams are dreaded. These kids, who were by now used to slogging for hours on the road, putting their best efforts, were much better equipped to handle this. They spoke of how running had tuned their minds off results and made them focus on the effort with a relaxed mind, just as they did in running. Some even revised their lessons while running together and claimed it helped them memorize better. Sure enough, their stress levels were down and performances were better. The cadets who passed out of the college and donned the uniforms, joined their new units as young doctors, and immediately endeared the seniors by their physical prowess and ability to perform far beyond the usual 5km prescribed as the assessment for physical standards of fitness. When these young boys and girls ran the distances of 10km and more, with ease, the soldiers and officers of the infantry looked at them with awe and admiration. These were young doctors, who practiced what they preached, and motivate their patients by personal example. What better way to promote healthy lifestyle, than by a bunch of doctors willing to walk the talk! Looking back, I feel this was my biggest contribution to my alma mater. Not only did it transform a group of college kids into ones with self-discipline and maturity beyond their age, it galvanized them into a force which was strong enough to take up the challenges of facing the tough training process involved in becoming a doctor. It built a character of perseverance and resilience which would hold them in good stead while they embark on the long haul that medical education and subsequent practice as a doctor entail. For their patients, a group of doctors with healthy minds in healthy bodies would be the best thing to happen, and for those joining the services, they would be such a role model and inspiring care givers. For the college, this would be an annual event of international standard, which would continue to nurture such students and faculty, year after year. It further enhanced the reputation of this institute of excellence in academics, carve its own space in the sports field. Running has an immense role as a character-building activity in an academic institution, something that other colleges can emulate. It not only would build a stronger, healthier professional but also a better human being to take on the challenges that lie ahead. An alumnus of AFMC, Pune, I am an endocrinologist serving in the Army, presently posted at Delhi. I ran my first HM in Jan 2010 and since then have run in various events across the country and overseas. I have been training with Ash Nath since 2016 and qualified for the Boston marathon in the year 2017, 2018 and in the recently held TMM in Jan 2019. I am passionate about running and helping others along the way by sharing my experience. I feel running helps build character along with good health and its promotion amongst more and more people, especially the youth, can help build a great community.